Cathedral&apos;s Amani Boston drove to the basket against a trio of Spartans in Monday’s win at St. Mary’s. LYNN — Cathedral junior forward Mackenzie Daleba sprained her knee last Tuesday against Arlington Catholic. The injury was unnoticeable Monday night against St. Mary’s. Daleba led all scorers with 16 points as the No. 2-ranked Panthers moved to 17-0 with a 55-41 victory over the Spartans in the Catholic Central Large showdown. [The knee] feels good,” said Daleba, who was medically cleared to play but is taking things day by day. “I’ve been icing it, resting it a lot. The 6-foot Daleba scored all of her points in the first half. She consistently displayed her versatility, driving to the basket and hitting outside shots —she hit a 3-pointer for her first basket of the game. Cathedral's Mackenzie Daleba gets a shot off over St. Mary's Jannise Avelino. St. Mary’s (12-6), which lost at Cathedral, 53-39, on Jan. 11 in their first meeting, kept things close in the first half, trailing 15-11 after the first quarter and 24-20 at halftime. “Even though we went up 17 on them at their place, I thought our four-quarter effort and intensity was better tonight,” Spartans coach Jeff Newhall said. 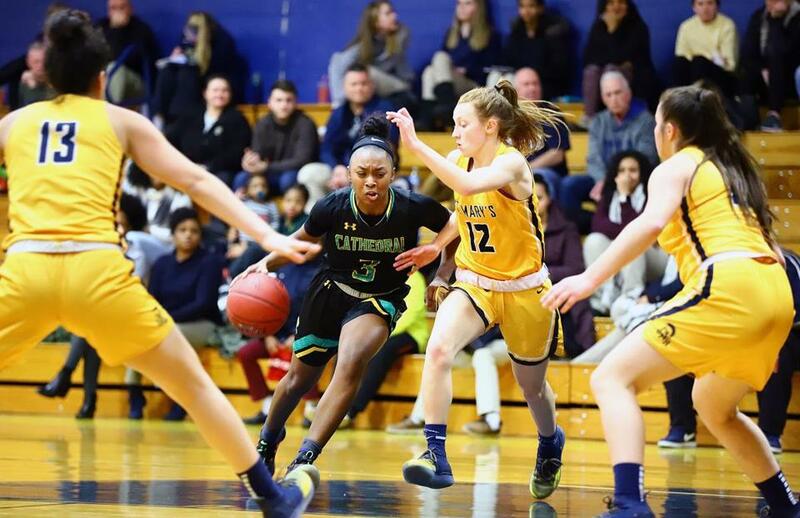 A 10-5 Cathedral run to start the third quarter, however, gave the Panthers momentum and allowed seniors Amani Boston (8 points) and Tayla Ballos (9 points) to slow down the pace of the offense and control the game. Ballos hit two fourth-quarter treys to put the game out of reach. 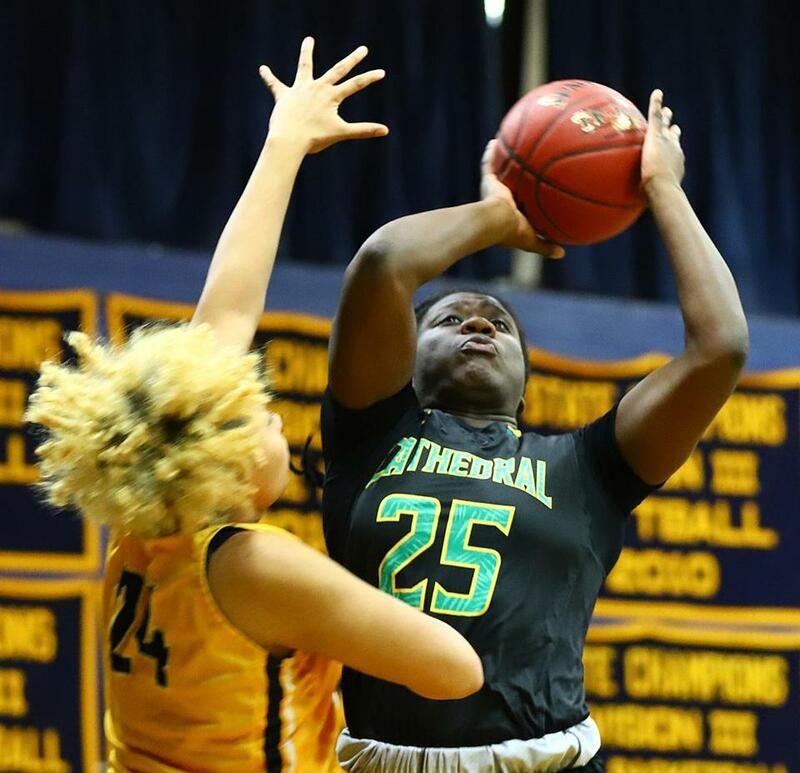 Cathedral continues to dominate opponents. All but four of its wins are by more than 10 points, and two of those victories are against out-of-state teams. The Panthers host Austin Prep Thursday before ending their regular season Saturday at No. 1 Belmont. Yirsy Queliz led the Spartans with 12 points. Blue Hills 45, Randolph 36 — Senior forward Ariel Carter poured in 23 points for the Warriors as they improved to 14-5. Case 56, Diman 36 — Sophomore Riley Fitzgerald had 33 points for the Cardinals (8-9). CASH 38, Burke 36 — Junior Teya Drumm had 12 points and 11 rebounds, and senior Rahkia Scott nailed two free throws with 19 seconds left to cap a comeback by the Chargers (6-10). Charlestown 54, Boston English 21 — Junior Alizey Marshall led the Townies with 30 points. Medfield 46, Hopkinton 39 — Junior Ceanna Kinney (16 points, 13 rebounds) posted a double-double to help the Warriors improve to 13-6. Reading 60, Lexington 33 — The Rockets (13-4) rolled to victory on the strength of a season-high 11 team 3-pointers. Saugus 37, Salem 17 — Junior Taylor Bogdanski tallied 12 points to propel the Sachems (13-7). South Shore Voc-Tech 48, Southeastern 46 — Brianna Ruffin scored 4 of her 13 points in the final 52 seconds to lead the Vikings (13-4) to a comeback victory. Austin Prep 69, Presentation of Mary 29 — Senior Colin Jeana had 11 points and 10 rebounds for the Cougars. Cardinal Spellman 57, Arlington Catholic 55 — Junior Craig Faria scored 26 points as the Cardinals (8-11) held on to win. Case 56, Diman 39 — The Cardinals rallied from a 5-point deficit thanks to a strong third quarter in which they outscored the Bengals, 22-10. Case closed out the game with strong defense, as Diman scored only 2 points in the fourth quarter. The Cardinals moved to 10-8 on the season behind 17 points from senior Logan Sherratt and 15 from senior Ryan McConnell. Dover-Sherborn 58, Dedham 53 — Senior Brett Stark recorded 20 points and 14 rebounds as the Raiders (15-4) secured the narrow victory. Medford 81, Winthrop 42 — Sophomore Alex Valera scored 24 points and senior Tevin Cadet added 15 points as the Mustangs (12-6) dominated. Mystic Valley 60, Lynn Tech 44 — Seniors Ben Soto (25 points) and Joshua Briceus (17 points) paced the Eagles (14-3). Whitinsville Christian 86, Norfolk Aggie 23 — Justin Vander Baan scored 18 points for the Crusaders (14-4). Winchester 71, Woburn 68 — Seniors Joe McCarron (30 points) and Michael Tavilla (24 points) led the Sachems (8-9) to the overtime win over the Tanners (4-13). North Andover 3, Danvers 0 — Freshman Patrick Green recorded 23 saves to notch his first career shutout for the Knights (10-6-2).